On Saturday August 16, 2014, St. Catharines Animal Hospital experienced an unfortunate accident. Our sweet clinic cat Cinnamon was playing in the reception area and noticed some birds outside. As a client opened the door to come inside, quick as a flash Cinnamon was out the door chasing the birds. This was unnoticed until 15 minutes later when Dr. Boctor went looking for her. Our security tapes told the story and for the next two months our staff put all their efforts into locating our beloved Cinnamon. Thank you to our local community and some clinic clients who gave their time and efforts to locate her. There were long nights of walking the streets, calling her name and shaking a treat bag. Posters were put up as well as live animal traps, all to no avail. 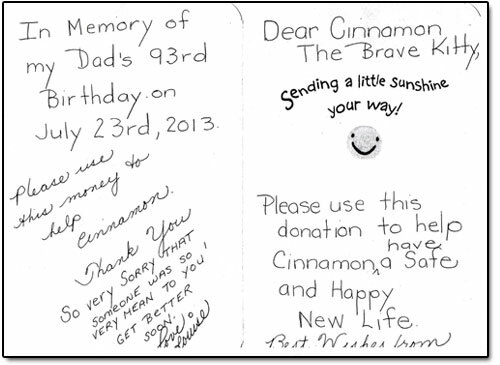 Everyone had started to given up hope and began grieving our beloved Cinnamon as the days turned into weeks. On Thursday, October 9th around 4:00pm (the Thursday before Thanksgiving Monday) a group of women brought in a box exclaiming that they had found our sweet cat. After peering into the box what greeted us was a very thin and very sick Cinnamon. What we recognized were her piercing blue eyes. The smell of infection that emanated from the box was so strong it was sickening. Our healthy 10 lb cat came back at barely 4 lbs. 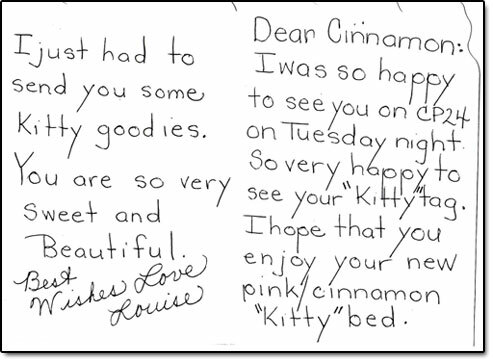 The doctors sprang into action and understanding clients were willing to wait as we attended to our dear cat. Cinnamon was hooked up to IV and given medication. Upon examination she had a large amount of skin missing from her chest and arm which were badly infected. She was weak and dehydrated and required constant observation. At 10:00pm that evening Cinnamon stopped moving. The doctors sprang into action and with all of them around her they were able to start her heart again. Sadly being so weak her heart stopped again but with the endless efforts of the doctors they were able to bring her back one more time. It appeared like she had a new start to life again. Over the next couple days all the staff and the doctors volunteered their time to watch and check up on Cinnamon. The outcome did not look positive since she was not eating which was essential to her recover. On Sunday, October 12th a miracle happened Cinnamon began to eat! It was truly a Thanksgiving miracle. 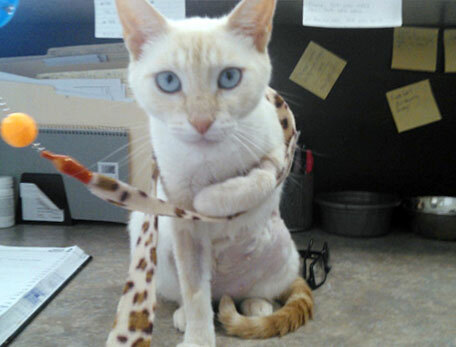 Her recovery has been very slow and tough at times but Cinnamon is on her way to recovery. 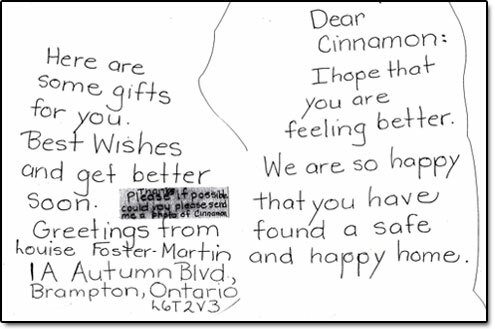 The Doctors and Staff at St. Catharines Animal Hospital want to thank all the people who have been coming in and visiting with Cinnamon and giving her their support and love. This is so important. She needs everyone’s love and prayers over the next few months until she is back to 100%. Again, St. Catharines Animal Hospital wishes to thank everyone for all their help and their prayers.